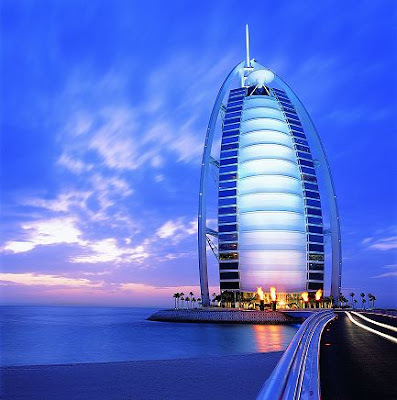 The Burj al-Arab is the world's tallest hotel. Dubai has developed from a small town into an ultra-modern metropolis in the last half century. Dubai is a fantastic city, with a forward-looking outlook. It has successfully modernized and developed an infrastructure that is capable of sustained development in future, but has also managed to retain its traditions. Burj Al Arab is one of the famous of Dubai property constructions, which still amazes us with its uniqueness. Dubai is one of the greatest architectural structure in the world and this is one of the example of it. No words needed to explain this photos. This hotel is GREAT!